ARTIST AND TITLE: BROUSSARD, MARC SILVESTRI, STJEPAN SEJIC, SHELDON MITCHELL, and NELSON BLAKE II - Artifacts #1 (Jam Cover), WHILCE PORTACIO - Shadowhawk #3, RILEY ROSSMO - Cowboy Ninja Viking #8. For full details on their July offerings visit Image Comics. I love Whilce's Shadowhawk! 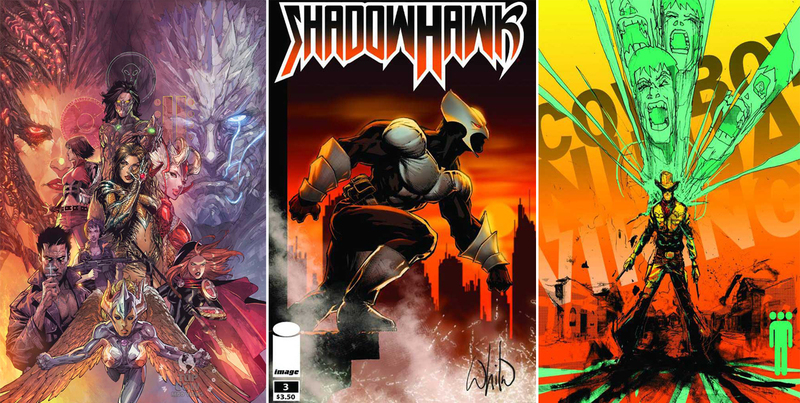 Although I stopped following the series, I am surprised to see a Shadowhawk cover done by Portacio. Yeah I think it's probably the best I've seen the character! Whilce is a great artist - who draws a mean Hulk - and it's good to see him tackle a few more cover gigs!